A classic which existed before Nosferatu and Metropolis, this is horror which is truly influential and very special. 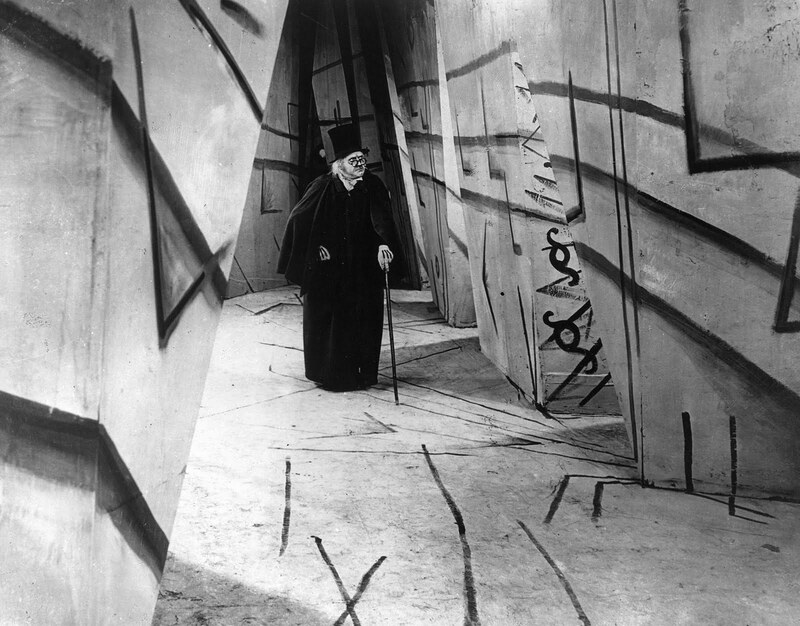 Directed by Robert Wiene, the narrative of The Cabinet of Dr. Caligari concerns a mysterious showman (Werner Krauss) who arrives in a small town during their annual fair. He amazes the crowd with his Somnambulist, Cesare (Conrad Veidt) who sees the future. However, Caligari has more savage plans outside of his act. There are various reasons why this film is very unusual and distinctive for a silent film. Firstly, the expressionism is astonishing through the use of a distorted film set. The characters live in a town full of sharp angles, trees with spikey leaves and diagonal stars. For an audience back in the early 20th century, when cinema was still developing, it must have been very disturbing to have seen something like this in contrast to typical light hearted comedies and historical dramas. The title cards are even stylised, something which I didn’t really except for a very old silent film and yet it really helped add a sinister nature of despair for audiences. Many scenes are also tinted in sepia, blue and green, almost giving the film a nightmarish appearance throughout as the investigations of the murders develop even more. The cinematography by Willy Hameister is also composed interestingly, there’s frequent use of close ups of characters such as Francis (Friedrich Feher) expressing constant dread due to the series of mysterious murders which includes his best friend as a victim. The close ups are also used on Caligari who expresses an obvious sense of fierce pleasure for horror whilst Cesare doesn’t really express, he merely awakens, foreshadows death and despair and sleeps again. Krauss gives a fantastic performance as the sinister Caligari, portraying him as mad man wanting to cause grief for the local community whilst showing unconditional care for Cesare. Veidt also portrays the dangerous Cesare beautifully as a dark, shady and submitting character controlled by Caligari’s hypnotic methods. The music of Giuseppe Becce is also composed tremendously with frequent use of crescendos and fortissimos to add more thrills and chills. This is certainly one of the best silent films I’ve seen in a while and not only is a film with creative expression, style and beauty, but arguably the first horror film and most certainly the first film with a brilliant twist ending. If you are reading this and not a fan of silent cinema…just watch this. A film which I found very frightening at times that I even jumped out of my seat at one point! Thrilling, deceitful and striking!